Should You Vaccinate Against Leptospirosis? There is a vaccine for leptospirosis, but I absolutely don't recommend it and I don't offer it at my clinic. It's a relatively weak bacterial vaccine that is short acting and can't protect against all 20 serovars of the Leptospira bacteria. 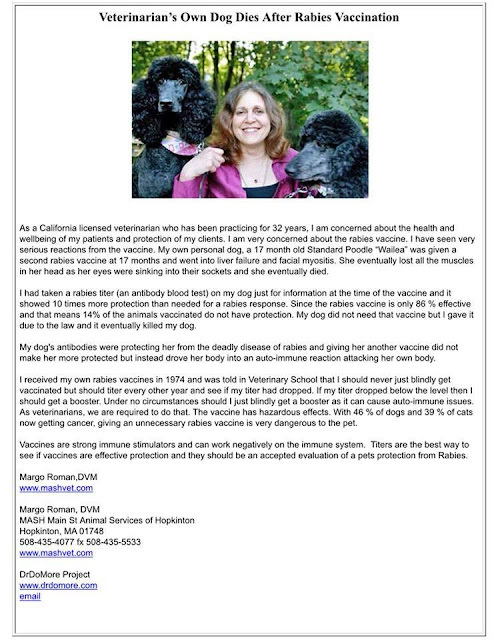 Unfortunately, many vets are still promoting repeated vaccinations for all pets, despite the significant risks. As I mentioned earlier, a leptospirosis infection is entirely treatable. So, my question is, why vaccinate for something that's one hundred percent treatable? I've handled about a dozen cases of lepto in my career and have never had a dog experience any lingering problems from the infection. I recommend you skip the leptospirosis vaccine. If you live in an endemic area like I do, make sure your dog's immune system is strong, and you can certainly go the extra mile by taking precautions to insure your pet doesn't have an opportunity to be exposed to the lepto bacteria. not only does he not recommend the vaccine for others, he does not vaccinate his own dogs for Leptospirosis.